Hello and welcome to another fabulous giveaway. I do love running giveaways here on the blog. I love to give something back to the followers, and see your comments when you answer any questions I pose. So, today I’m thrilled to be teaming up with Love Maps On to offer one of these amazing ordnance survey map canvases for your wall worth £99.99 including delivery. 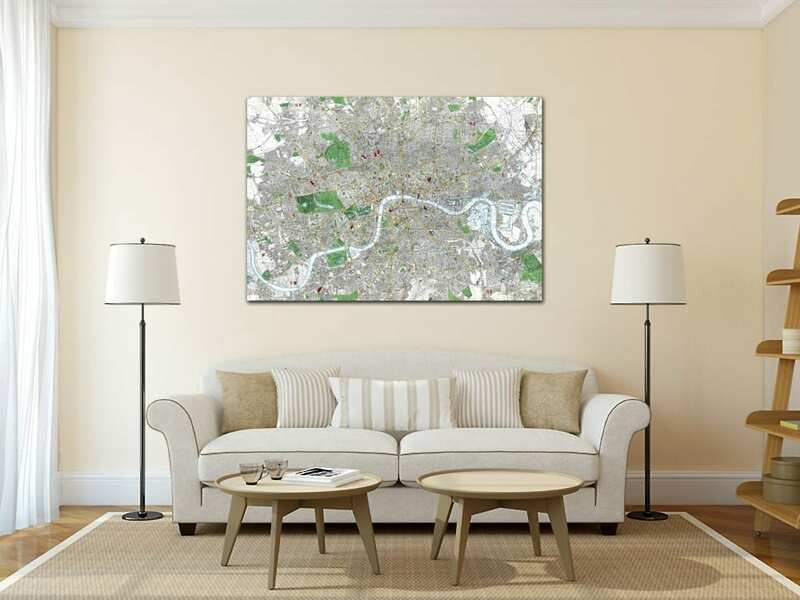 The prize includes a 36 x 24 inch canvas with a map centred on any postcode in England, Scotland or Wales which can be personalised with a title and inscription. This classic style map shows fascinating detail of a favourite place, a remembered home, or a family holiday destination, a special keepsake for those treasured memories. Canvas prints do not have the same print fidelity as paper prints due to the natural coarser weave of canvases. Fine detail or small type on some canvas map prints can lack the clarity that would normally be expected on a paper print when viewed at close quarters. Don’t they look fabulous? Maps in interior decor are very popular and on trend, and are a great way to add something unique and personal to your walls. There are a few different styles available as the prize so do check them on the Love Maps On website here. Full T&C’s are within the Rafflectopter widget above. Would love this in my Dining Room . I’d hang this in our upstairs hall, it is a huge double height wall so needs something to break up the space. I would love this above my sideboard. I would hang it in my lounge. Maps are definitely in. My boyfriend loves them, so I would give this to him, to hang in his office, with the map showing the Exe Estuary. On my home office wall. I would hang it in our pool room. I have a big blank space above my worktable in my studio – I would love a map centred on my childhood holiday home in Cornwall, where I hope to retire! Above the fireplace in the living room. It would replace a tatty old copy of the Haywain I have hanging in my living room. This would go above the fire place in my new house when we finally get to move in!!!! Wow I love things like this, and would certainly LOVE to win this map canvas! If I won I think that I would put it on the wall in my living room so that I could show visitors! I would hang this in pride of place on main wall in living room. Such a neat idea – would love to have one. I’d hang it here in my living room where I plot all my adventures! I absolutely love maps, and we are always off exploring all the local footpaths and are absolutely passionate about living where we do and the beautiful countryside! I would love to have this in my living room. I would hang it at the top of the stairs. I would put it in my bedroom so I could look at it every morning when I wake up. I would hang it in our living room above the fire place in pride of place. I would hang it in my kitchen or hallway. I recently got a LoveMapsOn county map canvas for my partner, and LOVE them. I’d really love a collection- so many meaningful places and I love maps. If I was lucky enough to be the winner, I’d choose the postcode of our house coz it’s our first family home and holds so many happy memories already. And I’d hang it in out hallway, opposite the large mirror. It would look fab! This is a wonderful giveaway and I know the winner will be delighted. In the living room above the fireplace. In the living room in pride of place. I hang it in the bedroom/office. I would love to hang this in the main hallway, it’s looking very empty in there! I would hang this in the lounge. I have just the spot! I would love to hang it above my bed so I can dream of lovely places and memories! I would love it in my living room. As a retired geography teacher, it would be especially special! I’d hang it above the sideboard in my dining rom. I’ve just moved back to the village I grew up in, so a local map would not only show where I live, but also where I grew up and where my Dad grew up. Awesome classic beautiful keepsake would love one in my house. I would have a map of the local area and hang it in the hallway as I often have guests who have never visited the area. I would love to be able to hang the map in my newly decorated hallway. Currently only living in a small apartment but would hang it in the most used room being the living room, and it would look great above my living room side board. I would get my map of Manchester and have the focus being the Parrs Wood Cinema in Didsbury! My partner and I went on our first date there when we were 17 and 3 years on, we’re still happily together and this will always be a place that’s special to us. Probably in my living room but might replace the map I have in my hallway. In my hall. Its the perfect ice breaker and a personalised talking point. I would hang it in my lounge! It would have to be in our lounge – it is the only place we have space! In the living room on the wall nearest the desk. I’d hang this in our upstairs hallway above the console table as there is a lot of white wall space there at the moment. I’d love to hang it in my dinning room. I would have it hung in my bedroom!